Vitamin E is an absolutely vital nutrient in your body, but it probably can't do half the things you heard it can. What does vitamin E do? To begin, it is an antioxidant. It tames dangerous free radicals and helps prevent blood clots and blockages in coronary arteries. Research points to its ability to reduce the risk of chronic diseases, such as heart attacks and some cancers. Vitamin E is also believed to slow the aging process and to help nerve conduction. Most importantly, it works to enhance and even protect vitamin C and Vitamin A. There is also promising research that vitamin E might help prevent or slow the onset of cataracts in the eyes. It might well prove that vitamin is helpful in some of these and other conditions, but probably not in many or even most of them. As with many vitamins, there is a raging debate over how much vitamin E you need. The US recommended daily allowance (RDA) is 8-10 milligrams per day. But most people in the nutrition field believe that to capture the long-term benefits, people need 10 to 20 times that quantity, which is well short of the maximum recommended 1,000 milligrams. Vitamin E is found in many foods in small quantities. The good news is that almost everyone gets sufficient vitamin E to avoid a deficiency, with a few exceptions noted below. The bad news is that most people do not get the RDA. This is definitely a vitamin that should be supplemented. Be careful about what supplements you choose, since the synthetic version of vitamin E is not even half effective as in its natural form. Look for nutritional supplements containing natural vitamin E, preferably in liquid form. People on low fat diets need supplements the most, since fats and oils are the largest sources of vitamin E. Nuts and green, leafy vegetables are also good sources, as are egg yolks and liver. So are whole grains. Vitamin E probably will never cure your broken heart, nor live up to half of the claims people make about it. But it is an important vitamin for maintaining good health and it is needed in quantities above what most people take in their diet. HISTORY OF VITAMIN C: Nobel Prize winning biochemist Dr. Albert Szent-Gyorgyi first isolated vitamin C in 1928. (As someone of Hungarian descent, I find this a touch exciting.) Vitamin C first got its reputation for beating the common cold in 1970, when fellow Nobel Prize winner Linus Pauling published his bestselling book "Vitamin C and the Common Cold". In it, he suggested that taking vitamin C at levels well above the USA RDA (now 60 milligrams per day) could strengthen the immune system and help ward off the common cold. BENEFITS OF VITAMIN C: Vitamin C helps form collagen, a glue-like fibrous protein in bone, cartilage, tendons and other connective tissue. Vitamin C helps give structure and maintain such body parts as bones, cartilage, muscle, veins, capillaries and teeth. But recent studies have also linked "adequate dosages" of vitamin C to preventing a number of common cancers, of helping boost the nervous system, of prolonging life, of reducing the risk of heart disease, of softening the symptoms of respiratory diseases such as asthma and cystic fibrosis, and of keeping skin and glands healthy. SOURCES OF VITAMIN C: Most animals manufacture their own vitamin C. Primates, such as humans, gorillas, and monkeys, have somehow lost this ability. Which is why we need to get our vitamin C from our diets. It is well known that citrus fruits, such as oranges, lemons, grapefruits, tangerines, limes, mandarins and others contain vitamin C.
In fact, vitamin C comes almost exclusively from fruits and vegetables. Other good sources are tomatoes, strawberries, raspberries, broccoli, asparagus, brussels sprouts, cauliflower, cabbage, peas, rutabagas, cantaloupe, kiwi, papayas, potatoes and watermelon. One place that is NOT a good source are vitamin C pills, which the body just cannot absorb properly. This is a water soluble vitamin best taken in its natural juice or in a liquid supplement (or both!). OPTIMUM USAGE OF VITAMIN C: Fortunately, if you consume too much of a water soluble vitamin, your body will get rid of excess. It also means that your body does not store it for long periods of time. You can't "stock up" on it, and you can reach a saturation point quickly; you need vitamin C several times a day. Being a water-soluble vitamin, you lose it when you boil foods. For instance, if you boil your broccoli, you will lose the vitamin C. However, if you boil your broccoli in a soup, you will get the broccoli's vitamin C in the broth. Do not soak or store fruits or vegetables in water, for you can lose the vitamin C that way. In short, the fresher cut the fruit or vegetable, and the less cooked, the more vitamin C you will get. Like all vitamins and minerals, Vitamin C is most effective when combined with other nutrients. For example, one of the big benefits of vitamin C is that it helps the body digest and absorb iron, an essential mineral for good health. It has also been found that vitamin C and E work together to help stave off Alzheimer's disease. This is one of the reasons it is so important to take vitamin supplements that contain as many different nutrients as possible, so the body can absorb them together and enjoy the maximum benefits from each one. 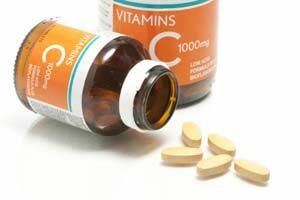 VITAMIN C DOSAGE: Most experts agree that the US RDA is only a fraction of what it should be, and that daily vitamin C levels up to 1,000 or even 2,000 milligrams per day are safe and healthy. Essential Nectar contains 250% of the US RDA, mixing it with 233 other natural, plant-based nutrients...making it a good vitamin C supplement for your diet. David Leonhardt runs the Liquid Vitamin Supplements Store.